I have yet to find an explanation for why this gem of an island is called ‘Ile aux Cochons’*. The nearest beasts to hogs that are on the island are the fat slugs of juvenile elephant seals that lie snorting and belching along the shoreline, and there is no evidence that pigs were ever there. The cosy 2-bunk hut set 100 m from the shore is in the style of a Swiss chalet, giving the impression that we were living beside an alpine lake. 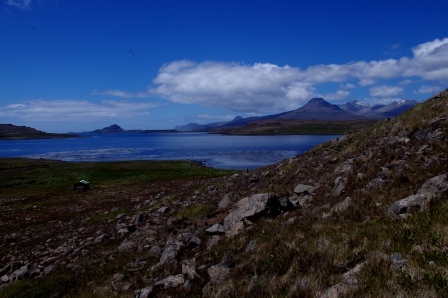 The view east from the hut is across alpine-like vegetation to a placid bay nearly enclosed by nearby islands, with the snow-capped peaks of Presqu’ile Ronarch (part of the south-east peninsula of Grand Terre) beyond. 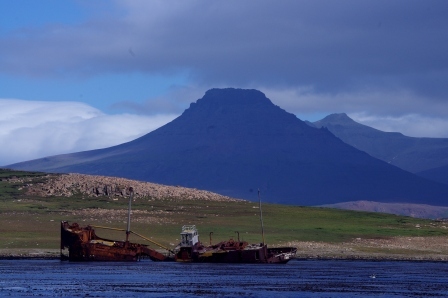 But the alpine mirage is fractured by the wreck of the whaling-supply boat Alberta (scuttled during the Second World War) across the ‘lake’, on the shore of Ile du Chat, and trypots and other whaling relicts along the near shore. Like most of the higher islands in the Golfe du Morbihan, Ile aux Cochons has a series of flat-topped hills surrounded by sheer bluffs of hard volcanic rock. The main summit (120 m) and the more distant western summit are obscured from the hut by a steep scarp that we climbed 2-3 times a day to reach the newly christened “Plateau des Jojo”s, our study site for the week. 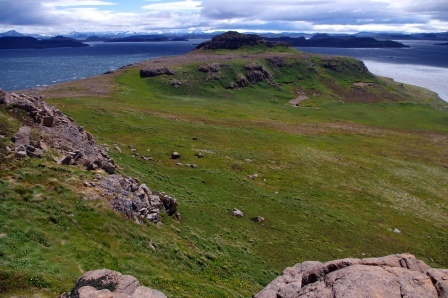 Ile Mayes, where we had stayed the previous week, was 6 km to the west, and is visible to the left of the western summit in the second photo below. 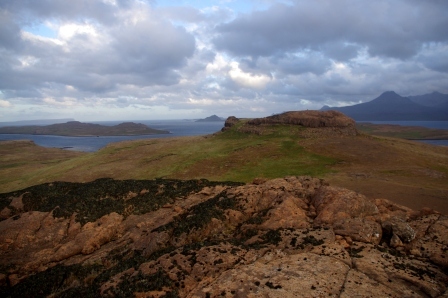 The two islands are very different in their vegetation and bird communities. 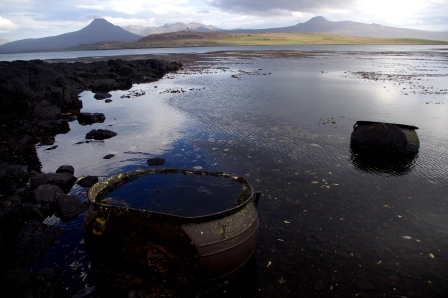 Mayes has never had browsing mammals, and Kerguelen cabbage (Pringlea) and cushions of Azorella were common. 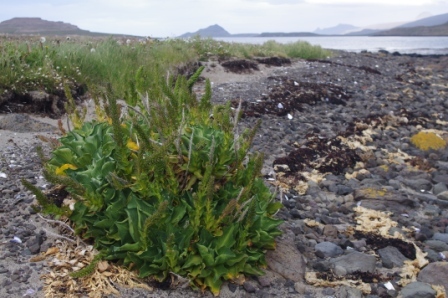 In contrast, we found Kerguelen cabbage almost exclusively along the shoreline of Ile aux Cochons (where seedlings had established after seedheads had washed ashore), and the few Azorella clung to vertical faces or nearby. We later learnt that rabbits had been eradicated from Ile aux Cochons about 15 years previous to our visit. We had deduced as much from the plant distributions and finding a few skeletal remains of rabbits, but it was interesting to see how long it takes for the more sensitive plant species to recover. Mice are still present on both islands, although I saw none, and only noticed their droppings on Ile aux Cochons (in the hut). 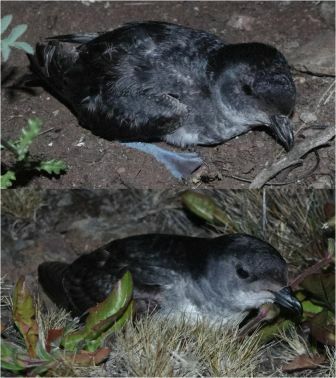 Both islands have abundant breeding petrels of eight or more species, returning to their burrows after dark (see next blog). Several species are shared, but Ile aux Cochons has large populations of Antarctic prions and South Georgian diving petrels, which we did not see on Mayes, as well as common diving petrels. The diving petrels were the focus of our visit, and it was fascinating to find these two similar species breeding within tens of metres of each other, although using different habitats. We called them by their local names of ’plon plon‘ (common diving petrel, from le pétrel plongeur commun) and ‘jojo’ (South Georgian diving petrel, from le pétrel plongeur de Géorgie). The plon plons bred in deep burrows among dense vegetation on the coastal scarps, while the jojos were in shallow burrows among rocks on the sparsely-vegetated plateaux. 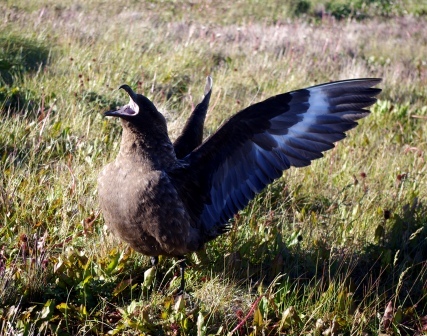 The top predator on both islands was the southern skua, which were feeding almost exclusively on petrels. 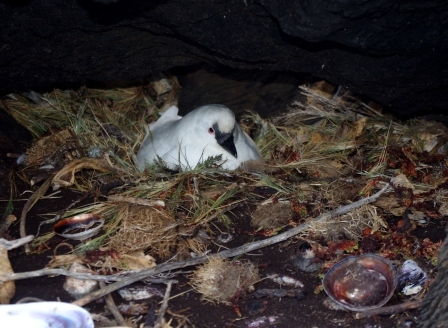 We found them among the petrel colonies at night, and also attempting to dig birds out of their burrows in daylight. We worked long hours during our stay, particularly at night, usually climbing into our sleeping bags after 2 am. 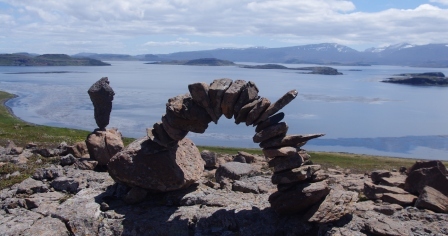 But the jojos were an obliging study species, allowing Aymeric Fromant time to indulge in his passion for ephemeral sculpture, and all three of us time to explore the scenic 155 ha island. 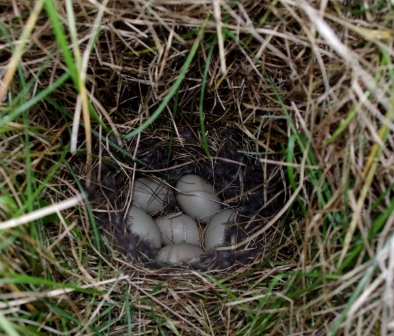 This included finding a couple of small colonies of Kerguelen shags, three sheathbill nests (all with two eggs), and a well-concealed Eaton’s pintail (duck) nest. But the highlight for me was finally convincing myself that there is such a thing as a Kerguelen tern. They are supposed to be the more numerous of the two tern species on Kerguelen, but everywhere I went I kept seeing Antarctic terns, including five nests all with single eggs (two on Grand Terre, three on Ile aux Cochons). 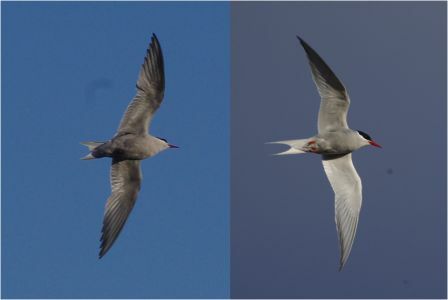 While I was very interested to see the Antarctic terns on Kerguelen (a species I have studied on the Snares Islands), I was beginning to doubt that I would see a Kerguelen tern – a species that looks and behaves very like the black-fronted tern in New Zealand. While checking one of the Antarctic tern nests, Charly and I noticed a second adult tern flying about that did not join the first (Antarctic tern) in trying to drive us away. 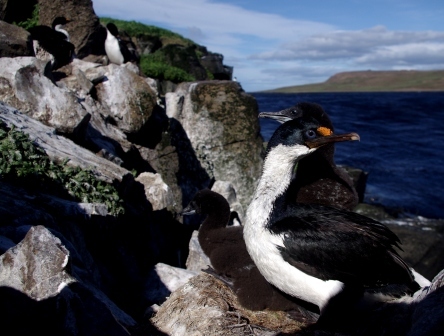 The newcomer was smaller, darker, with a shorter, darker bill and shorter tail. We saw it only in flight, but that was enough to turn the myth into reality. *Note that there is a larger island of the same name in the Crozet Islands. Te Papa curator of vertebrates Dr Colin Miskelly’s participation in seabird research programmes on the French subantarctic island groups of Crozet and Kerguelen was at the invitation of Dr Charly Bost of the CEBC laboratory (Chizé) of CNRS (Centre National de la Recherché Scientifique), France, and was supported by the Institut Polar Français Paul Emile Victor (IPEV) and Te Papa.